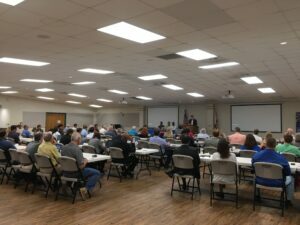 The Sixth Annual Northwest Florida Brownfields Redevelopment Forum was held recently at the Jackson County Agriculture Center. The Florida Department of Environmental Protection’s Northwest District, U.S. Environmental Protection Agency, and West Florida and Apalachee Regional Planning Councils invite local governments, investors, developers, and other interested parties to learn about Florida’s Brownfields Redevelopment Program. The Brownfields program facilitates redevelopment and job creation by empowering communities, local governments, and other stakeholders to work together to assess, clean up and reuse properties that may have been previously impacted by pollutants. NOVA participated as a Gold sponsor for the event, and Larry Schmaltz presented on our behalf. Larry’s panel discussed the Practical Benefits and Issues in the Redevelopment of Brownfield Sites.